Plunger, the first submarine torpedo boat to be built for the Navy, was authorized by Congress 3 March 1893; a contract for her construction was awarded to Holland Torpedo Boat Co. 13 March 1895. 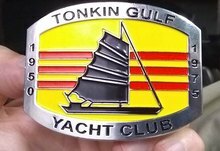 However, the boat and the contract were cancelled in April 1900. 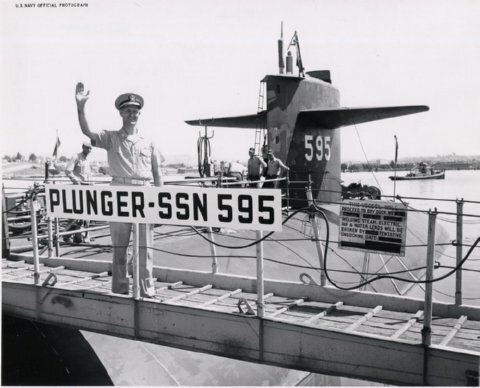 The third Plunger (SSN-595) was authorized as an SSGN but was laid down as an SSN 2 March 1960 at Mare Island Shipyard, Vallejo, Calif.; launched 9 December 1961; sponsored by Mrs. Clinton P. Anderson; and commissioned at Mare Island 21 November 1962, Comdr. William M. Adams in command. Following a trip to Puget Sound 27 November to test torpedo tubes and sound gear, Plunger departed Mare Island 5 January 1963 for shakedown to Pearl Harbor. Plunger next was homeported at Mare Island and operated to test the performance of sonar and the fire control system. In April she changed homeport to Pearl Harbor, where she became flagship of ComSubDiv 71, 1 April. Continuing in a testing capacity, Plunger evaluated the most advanced class of nuclear attack subs. Operating off the U.S. west coast during the spring and summer, she proceeded to Wake Island 15 September 1964 for SubRon Operational Evaluation missile firing. At Pearl Harbor again in January 1965, Plunger was selected to demonstrate the capability of the Navy's latest ASW weapon system to Dr. Donald Hornig, Special Assistant to the President for Science and Technology. At Wake Island in May, Plunger participated in C/S-17, the SubRon Operational Training Test. In September she prepared for WestPac deployment, which continued into mid-1966. During this deployment, Plunger conducted evaluation exercises of AN/SQS-36 sonar and traveled as far east as Okinawa and Subic Bay. She also conducted ASW exercises and executed oceanographic and port surveys. At Pearl Harbor with SubRon 7 in 1967, Plunger operated to improve the ASW readiness of the Pacific fleet; from 6 to 22 March, she participated in ASW exercises and later continued in advanced type-training work. During inport periods at Pearl Harbor Plunger provided services to Fleet Training Program Pearl Harbor. Homeporting at Puget Sound the last 6 months of 1967, Plunger returned to Pearl Harbor 1 February 1968 and continues operations with the Pacific Fleet into 1970.